Please allow users to add their own control points to slurs in the next version of Finale. This one capability would be worth more to me than any other change you could make. I could see the possibility of adding an additional slur option to the palette - I'll call it a "Flat Slur". It would have an additional control point allowing you to produce a slur where the mid section of the span is truly flat. Others have asked for this and it has often been used in traditional plate engraved music and pen and ink autography. As I see it, adding control points to a slur a la Illustrator would require a lot, lot of changes to the interface. The current Smart Shapes are "hard wired". There would have to be an Illustrator-like interface to make each shape "live" and individually editable. What kind of problems are you running into? I've never had difficulty producing slurs that were not at least "passable". Thanks for your comments, N.
http://notat.io/viewtopic.php?t=207 contains an example of a slur that cannot be accomplished at all in Finale, but is now possible in LilyPond. If Finale wants to keep up with rising standards, it will need to be able to produce slurs of ANY shape. Have you actually submitted this as a request? I'd be surprised if anyone from MM was looking at this forum now. If you want more "hook" or as Finale calls it "inset", use the second control point from the left, or the right. You can see on the graphic that I had to drag it quite a ways to the left. This image has been viewed 453 time(s). I have been urging for this since several years back. I am not sure what is their priority. Thanks, N. I can usually get what I want with your approach, but in this case I want less hook at the end of the slur, but more bend a bit before the end to avoid high notes. The two requirements seems to be in opposition. At least, I can't get what I want after quite a bit of work, but I'll keep trying; maybe I can get closer. The more general problem is that with so few fixed control points, one is constantly compromising. If Finale wants to remain at the top, it will need to improve in this area. Vaughan mentions that Dorico can already do this, something that Finale has not been willing to take on in all these years. It is inexplicable to me why such a natural improvement to the software was not introduced years ago. Back in 2000, an engraver who had called MM on numerous occasions to request it, contacted me after I started a thread about it. It was my first post (apparently no longer available in the archive), and it will now be my last. I believe I also posted on the subject at Finaleforum around the same time. See you all over there and at Notat.io, and maybe at Dorico as well! Using flat ties (or more often slurs) definitely improves the layout. However, I would not insist MM to concentrate on this instead of fixing the speed and responsiveness of the graphical processing. IMHO specially prepared font for such needs would be one of the best solutions. Flat ties are usually just one space high. So there are only 10 glyphs to create them (2 for left and 2 for right *2 fro each directions + 2 dashes). Applying them form smart shape palette with double click using meta tool works instantly and solves all issues. 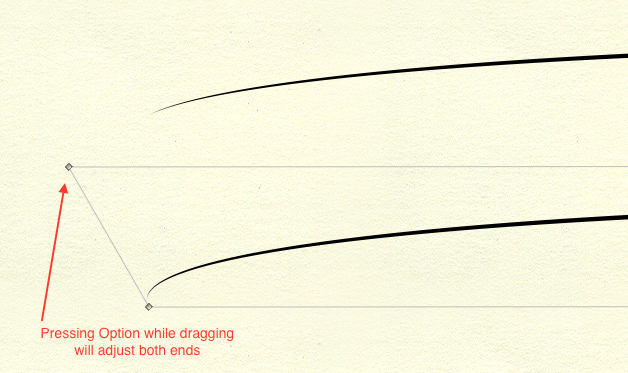 Here are two kind of them – with very pronounced arc and with smooth ramp (if this is the word in English). I think that the second one works better in most situations for and particularly for larger distances between notes. Thanks Wess, that is an intriguing solution for flatish ties and slurs that I will explore, but I am more interested in the slurs of irregular shapes that are impossible to create in Finale. For my uses, basic things that are now impossible in Finale take precedence over things that need improvement or refinement, like speed. But speed is not an issue for me. I understand that it might be for others, however. Wess, would you consider selling your flat tie font? I think I understand how you would set these up in the Smart Shape Tool - [Start of Tie Text Left - Repeated Continuation of Flat Segment - Finish of Tie Text Right]. The only variable would be a given user's tie thickness settings, and this could be accommodated with a range of various thicknesses for the font characters. Wess, that is astonishing. Your ability to get the best out of Finale never fails to amaze me. I agree wholeheartedly, Christopher Smith. Wess's solutions to all matters of engraving issues are unsurpassed, and I have gained so much from him, for which I am very grateful. Thank you again, Wess, for all of your help and inspiration!